That is, of course, unless you’re one of those people who just doesn’t care about sports. Anyone who’s on social media has heard from those people at one point or another over the course of year, be it on Super Bowl Sunday or during Game 7 of the NBA Finals. You know the tweets. While everyone’s entitled to their own likes and dislikes—Star Wars, the Oscars, sports, whatever—the #sportsball trend does more harm than good. It’s pure assholery masquerading as hipper-than-thou elitism, and it ignores the fact that, for all their concussion-driven faults, sports really do have the power to change entire cities for the better. Just ask Cleveland. Cleveland’s riding high right now, and it’s due in part to sports. Say what you will about the nature of modern athletics, but LeBron James and the Cavaliers have, alongside the Indians and Browns, become a rising tide that is helping to lift a whole town’s long-struggling boats. 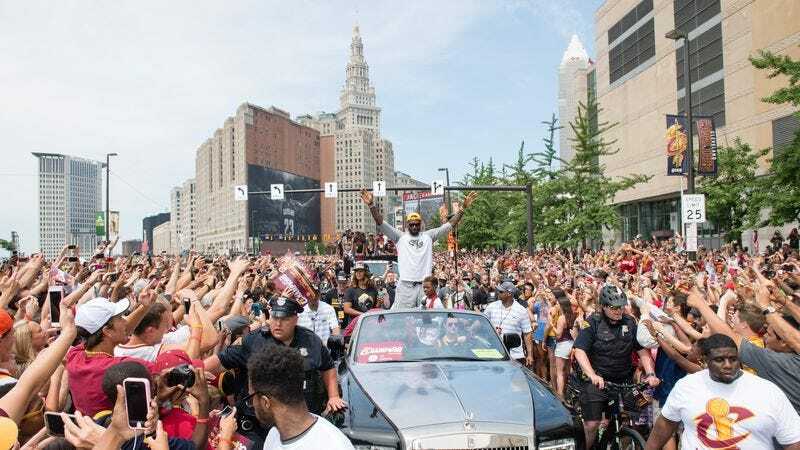 There’s optimism in Cleveland again, and while it’s a bit of an odd feeling for most longtime residents—the emotional equivalent of a gifted cashmere sweater you could never have afforded on your own—it’s also remarkably refreshing. That kind of positivity could make a big difference for a city so noted for its pessimism. David Gilbert, president and CEO of the Greater Cleveland Sports Commission and Destination Cleveland, says the Cavs’ win “could mean more [to Cleveland] than any other sports championship in any other city.” Though he says the city has “suffered from such a ‘woe is us’ can’t-do attitude as a community for a couple of generations,” Gilbert thinks the Cavs’ victory, coupled with the upcoming Republican National Convention, may help flip the switch for Clevelanders in terms of civic self-confidence and self-image. “When you go into anything in life thinking that you’re not going to win, you’re not going to win,” Gilbert says, noting that, “That has largely been Cleveland’s M.O.” As recently as three years ago, Gilbert says that Clevelanders were “far, far, far” less likely to recommend their own community to visiting family and friends. Now, that tide has turned, with Clevelanders both recommending their town to others and moving back into the downtown metropolitan region. About 97 percent of downtown housing is full, with around 60 percent of those residents identifying as millennials, all of whom have cash to burn and Cleveland pride to spare. That positivity has spilled over onto local businesses, who are raking in those pro-Cleveland bucks. When the Cavs, Indians, or Browns are winning, Cleveland’s bars, restaurants, hotels, and T-shirt manufacturers are winning as well. Take, for instance, The Westin Cleveland Downtown, which says it did record business on the day of the Cavs parade. According to Bob Megazzini, the hotel’s general manager, “The bar was open at 7 a.m. By 8 a.m., people were five deep at the bar. More than half our sales that day were from beverage alone.” Consider that data point alongside the fact that the hotel—along with every other hotel in downtown Cleveland—was at capacity, and it’s an impressive economic indicator. Clevelanders, it seems, want to support their town. They want something to be proud of, and now they have it. Sports—and #sports, and #sportsball, and all those other derogatory takes on the word—matter in Cleveland, whether the internet’s biggest smartasses and whiners like it or not.